Health concerns are one thing Christians and non-Christians have in common. And because Christian medical personnel in North America have been blessed with good training and medical resources, medical ministry clinics have been used greatly of God to help hurting people in countries lacking good medical care. Some medical clinics, both mobile and stationary, are conducted by career missionaries as an ongoing part of their ministries. Other medical ministry clinics are short-term mission projects, usually staffed by North American medical personnel. Both types of clinics can and have worked effectively to bring health care and the gospel to people who need them. But, there are issues that concern, even alarm, many missions experts! Gospel presentations given in many medical ministry clinics are brief and shallow, even with people who know very little about the true God, the Bible, Jesus Christ, and salvation by grace through faith. Eager to please Christian medical personnel in order to receive free treatment, many nationals are willing to say “Yes!” to anything they are asked to do. 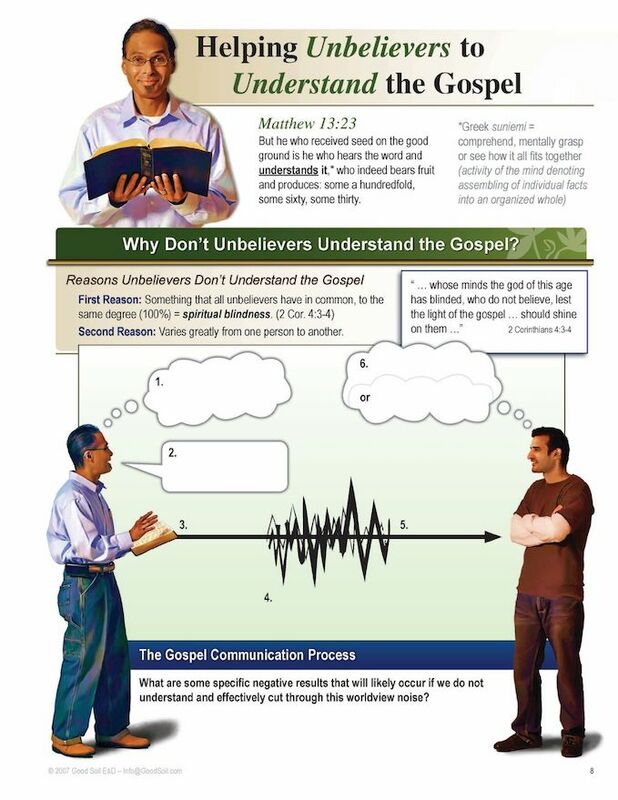 In many cases, it is probably wise to limit gospel presentations to what is commonly called “pre-evangelism” (Good Soil calls it “tilling” and “planting”) and let experienced missionaries handle the “reaping”– leading patients to genuine faith responses when they are confident that they clearly understand and are ready to genuinely embrace the gospel. Some medical workers, especially short-termers on project trips from North America, have little Biblical and theological training. And virtually none of the short-termers understand the challenges of cross-cultural, “world-view noisy” evangelism. Consequently, medical clinics often report large numbers of “conversions”, but the long-term spiritual results are dismal. Good Soil seminars were created to equip missionaries and others for worldview relevant evangelism and discipleship. Medical personnel who participate in a Good Soil seminar become aware of many of these issues and learn lots of key tips and tools for evangelism with people who know little or nothing about the true gospel of Jesus Christ. Some missionaries have the wisdom to always connect their medical clinics to nearby local churches for ongoing ministry to clinic patients, but many—especially North American project-clinics—do not. Thus, while the humanitarian goals may be met through the clinics, opportunities for evangelistic follow-up, discipleship, and church planting are missed. Plan medical ministry trips in conjunction with church planting missionaries and establish a plan, prior to the clinics, for connecting clinic patients to local churches for follow-up. Be sure to collect adequate information on patients, so that they can be contacted later for purposes of verifying professions of faith, conducting discipleship, and incorporating them into a Bible-believing church. Understand key principles of cross-cultural evangelism that are found in the New Testament, especially from the ministry of the apostles in the book of Acts. Good Soil is solidly based on a Biblical theology of evangelism and missiological worldview-relevancy. Then, participate in a Good Soil TRAINER CERTIFICATION workshop, where you will be qualified and certified to teach Good Soil seminars on your field or to others in your ministry with medical personnel. 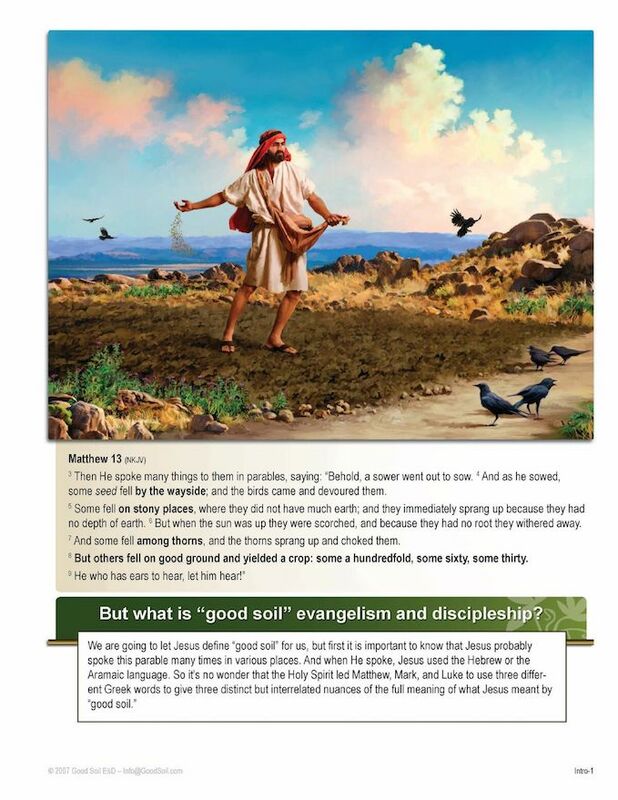 Last week, we attended Good Soil Evangelism and Discipleship training, which included The Way to Joy discipleship workbook and The Story of Hope evangelistic Bible study workbook. I highly recommend these resources. 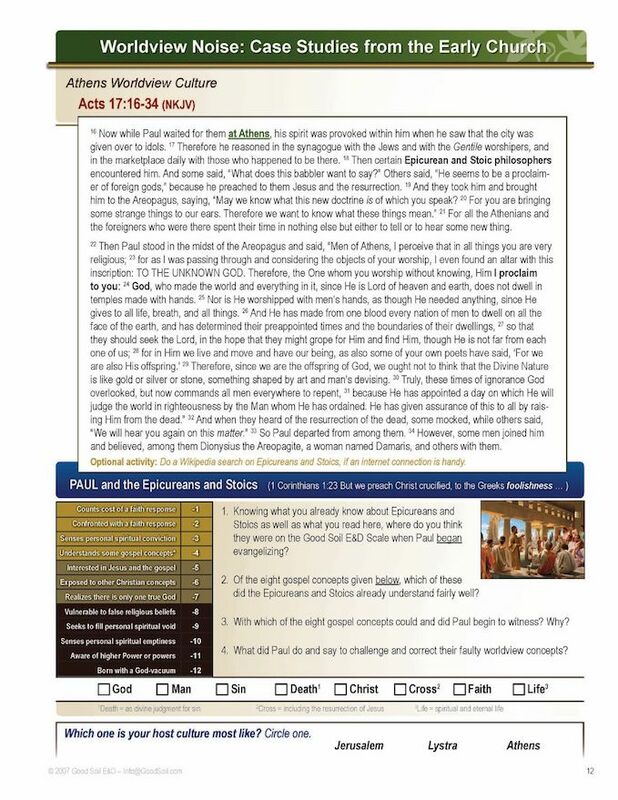 The evangelistic study is especially good, as it covers the 40 most important events in the Bible so Bible study participants can capture the big picture, and also includes the Chronological Bridge to Life, which includes the eight essential concepts someone needs to grasp to be saved (God, Man, Sin, Death, Christ, Cross, Faith, Life). What really struck me is how I´ve often short-circuited the process of evangelism, skipping over key concepts or not explaining the story line of the Bible. In our culture here, you may get "decisiones" but the person may not have truly understood the gospel. The Story of Hope was specifically created for evangelism (or discipleship) with people from non-Christian worldview cultures—for missionary ministries. It is time-flexible. You can use it in one-on-one studies, in groups studies, or individuals can use for self-study. There is also a Global English Edition available, written at a 9th grade reading level. 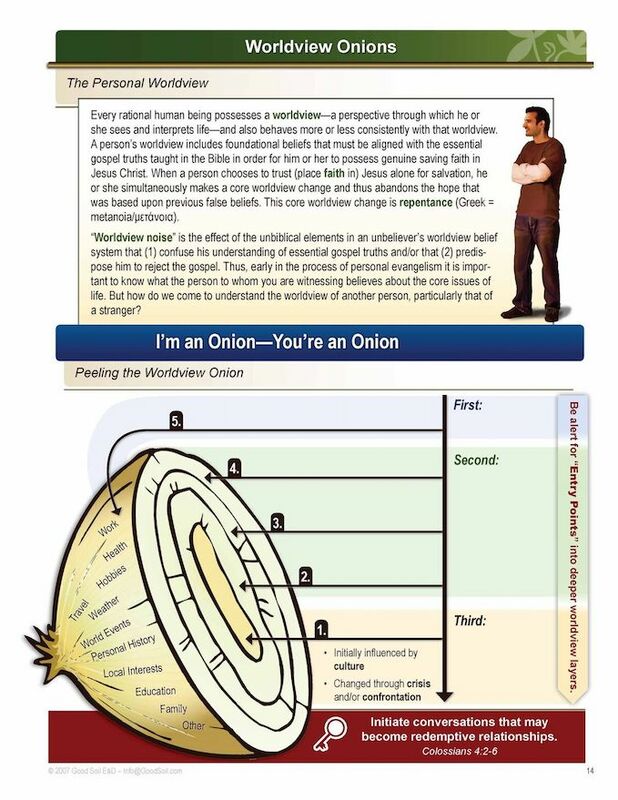 13.5” x 10.75” laminated printed teaching visuals. 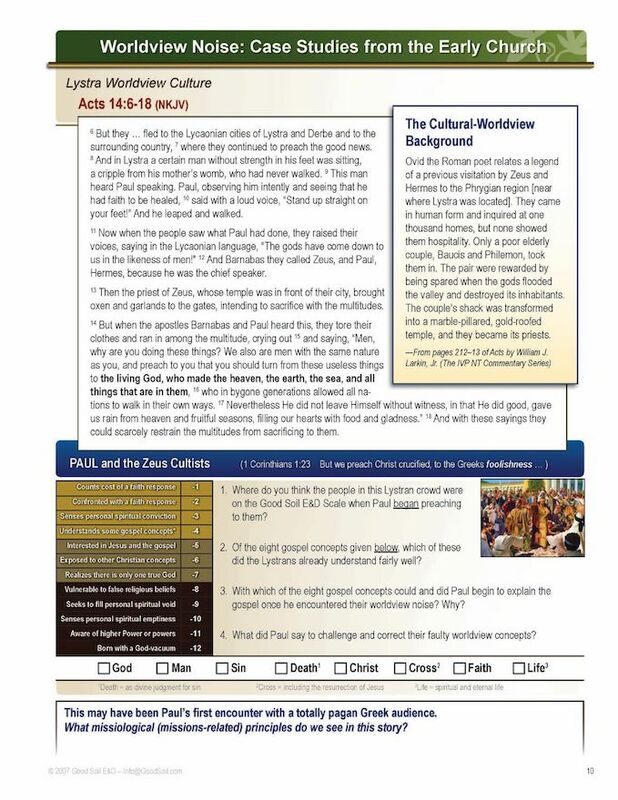 Key Bible event content on the back, event image on the front. 105 teaching visuals, 50 Old Testament and 50 New Testament, plus five that work especially for ministry with Muslims. Great for teaching the BIG Story of the Bible that begins in Genesis and culminates in Revelation. Key content on the back side is translatable – just request the document for translating the text into the language you need for your ministry. It’s possible that your ministry language document might already be available. 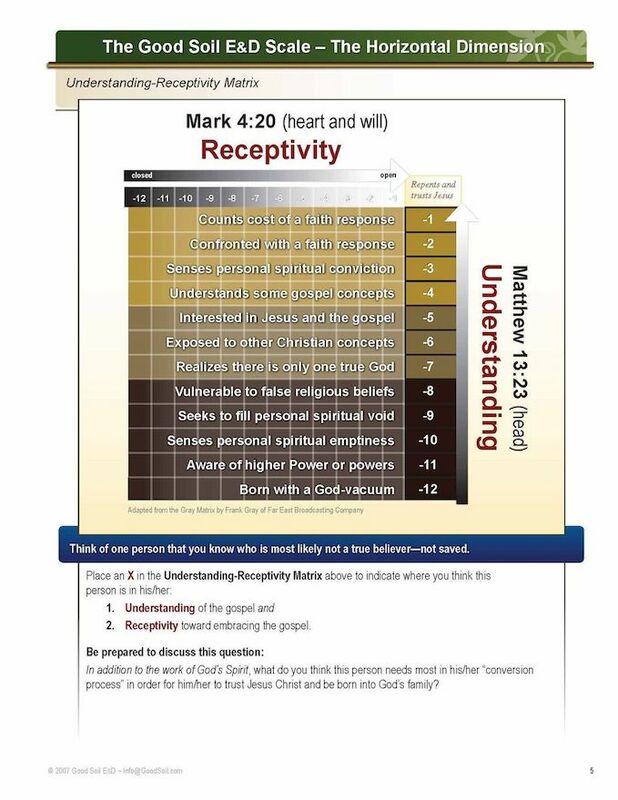 We recommend that you take some sets of these teaching visuals to the field with you, use them in your ministry of Bible teaching and evangelism—while you are there demonstrate to nationals how to use them—and leave them with national church leaders when you return home to North America. We continue to work with the pastors and their wives at the Simbai Baptist Pastors’ and Wives’ Fellowship. In November, we introduced them to The Story of Hope (TSOH), an evangelistic tool which includes 40 laminated picture cards. TSOH is a short story of the Bible and God’s provision of salvation. Our pastors are excited about this tool. We have 30 sets of cards for them and will be giving them some concentrated teaching and training beginning next year. 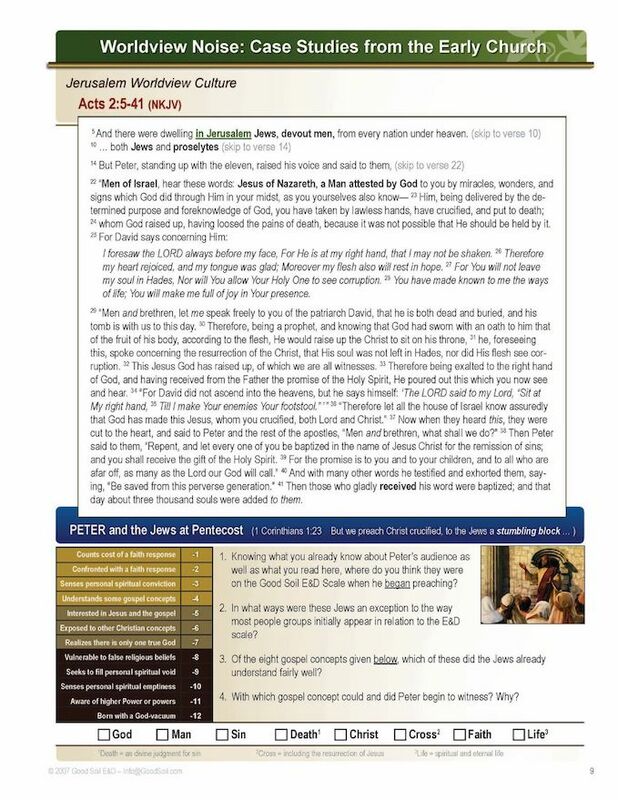 A great Bible teaching resource to use for gospel presentations in medical ministries. Great Bible training for your medical missions staff, especially those who have never had an opportunity for a Bible education. Ask us about a group rate. Gaining Ground with Good Soil is a story about and for missionaries and other cross-cultural ministry workers. In an interesting narrative form, the book explains the theology and missiology of evangelism and discipleship of Good Soil E&D. You will love the story of a missionary couple, and their national colleagues, who learn some Biblical principles that revolutionize their ministries—Good Soil principles that can help you to become more effective as well. The audio book can be downloaded to your phone or pad. It’s a good resource to recommend to all members of your medical ministries team. All the resources needed for teaching Gaining Ground with Good Soil in a small group or class. If you are a leader of medical ministry teams, with a USA shipping address, and will commit to reading this book, we will send you a FREE (and postage-free) copy of Gaining Ground with Good Soil. Good Soil provides an entire toolbox of resources for medical ministry teams. A guy (Mausman), in our newest church plant in Papua New Guinea, told me his faith story in church today, after I preached about Nicodemus in John 3. Mausman was saved in one of our mobile medical clinics a few months ago, where we used The Story of Hope printed teaching visuals to present the gospel. Here is what he said, roughly translated from Pidgin: I was like Nicodemus. I had church but not Jesus. When you showed the pictures to us, I knew some of the stories, but I realized I had church not Jesus, like Nicodemus. Thank you! Calvary Care Home, a ministry of Calvary Baptist Church of Richards Bay, South Africa, is situated in one of the AIDS hotspots of the world. Calvary Care Home provides care for four HIV+ hospice women, with the goal of providing compassionate care along with gospel teaching. Reaching people with the gospel is an extremely urgent task when the death rate of those to whom we minister is so high! When The Story of Hope was completed in the Zulu language, reaching those close to death became a bit easier (at least we now have a good gospel-teaching resource in the Zulu language!). Many challenges exist as we present the gospel to people in this culture. Commonly, people mix ancestral worship with teaching about Christ and God. The Story of Hope provides a systematic way of working through God’s Word while dispelling common misbeliefs about God. Before taking in our first patients, all of the caregivers were taken through The Story of Hope. It is not uncommon to come into the home and find a caregiver reading through the material with a patient. This thrills our heart! Yesterday one of our pastors preached a funeral with over 1000 people attending. He decided to use the printed teaching visuals. I know they are small for such a large group and odd for a funeral, but there were some salvation decisions. We are presently working with a fellowship of 10 churches that are affected by, or started by, the medical clinic ministry. We are using the teaching visuals with the 10 ministry teams that are going to present the Gospel in 27 villages over the Christmas season.We have had a lot of drought recently and a lady gave us some funds to buy rice so we are able to give a packet of rice to each person that will be hearing the gospel in these different villages. This represents about 3500 people. God is really using the material. 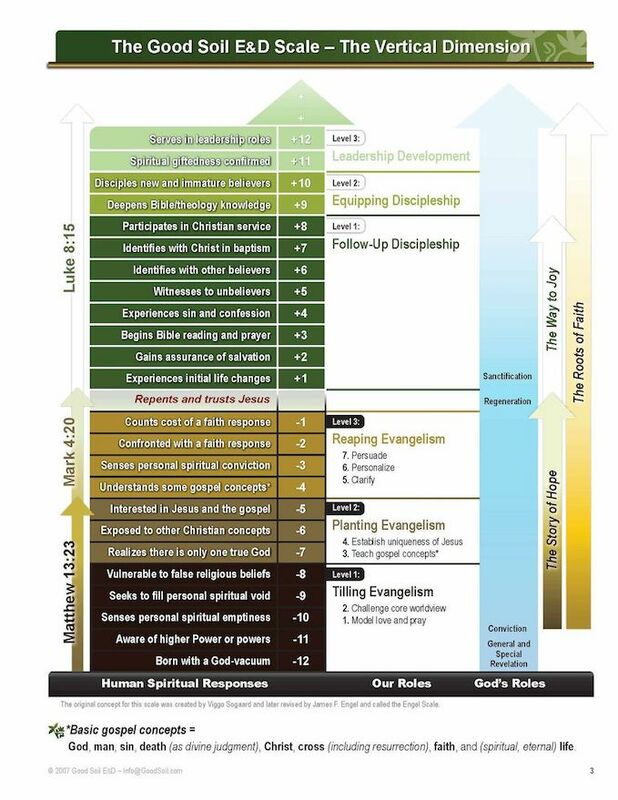 The focus of this page has been on using Good Soil in your medical ministry team.